What Is The Right Way To Eat Sushi?
. Eating Sushi can be little intimidating, especially for the first timer. Even sushi-regulars can discover something new about the traditions. While no one will throw you out of the sushi bar for drinking sake with your nigiri, we hope that reading the following guidelines will calm your nerves and help you get the most out of your next visit to a sushi restaurant. You don't have to restrict yourself to the menu. Ask your server if there are any seasonal options available. Asking "What's fresh?" implies that the chef serves food that's not fresh, so it should probably be avoided. If you go to the same sushi bar frequently, get to know the chef. If he knows what you like, he may recommend new or special dishes for you to try. Dip the sushi fish side down into the soy sauce. This will also help prevent the rice from falling apart. Only use a little soy and wasabi. You want to taste the fresh fish; don't overpower it with salt or heat. Eat the sliced, pickled ginger between bites — it's there to cleanse your palate, not to flavor the bites. Greet others, and show respect, by bowing, not a handshake. 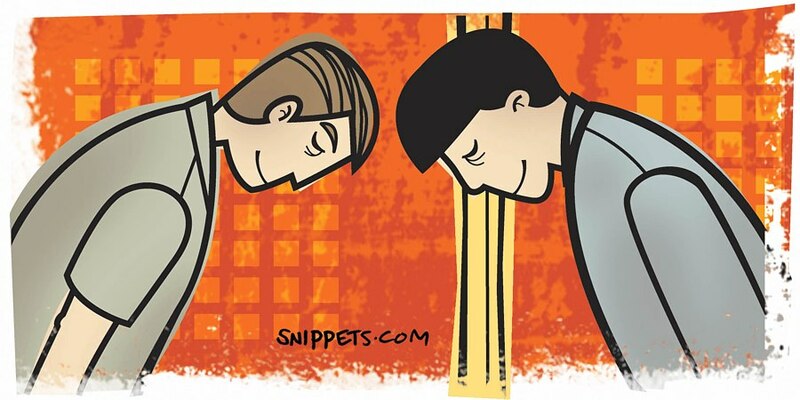 You don't have to initiate a bow, but you should bow in return if someone bows to you. A few rounds of bowing may occur. Go along with it; it's a sign of respect. 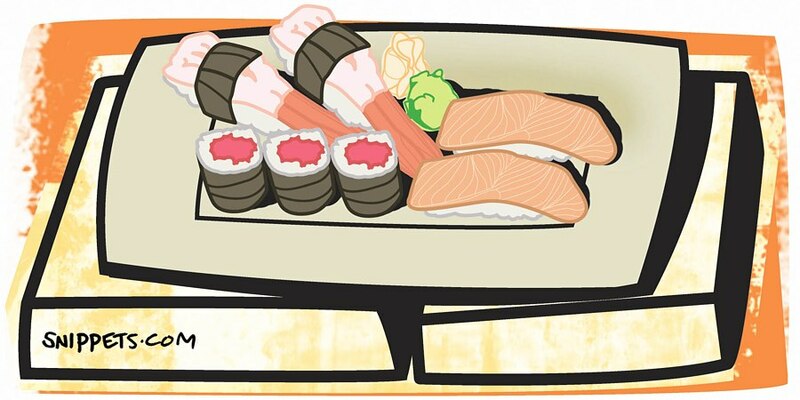 If you do eat sushi in two bites, don't put the second half back on your plate or the communal plate. Don't mix your wasabi in your soy sauce. Add a little dab directly to the sushi if you want a little more heat. 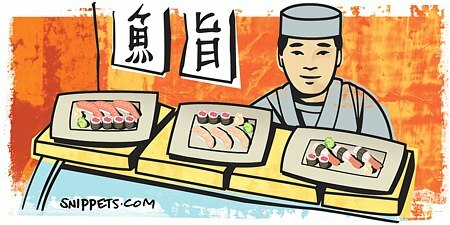 There are two main types of sushi — sushi rolls ("rolls" for short) and nigiri sushi ("sushi" for short). Nigiri sushi is what most of us think of when we talk about sushi. It's a piece of fish (or other ingredient, like egg or octopus) on top of an oblong ball of rice. 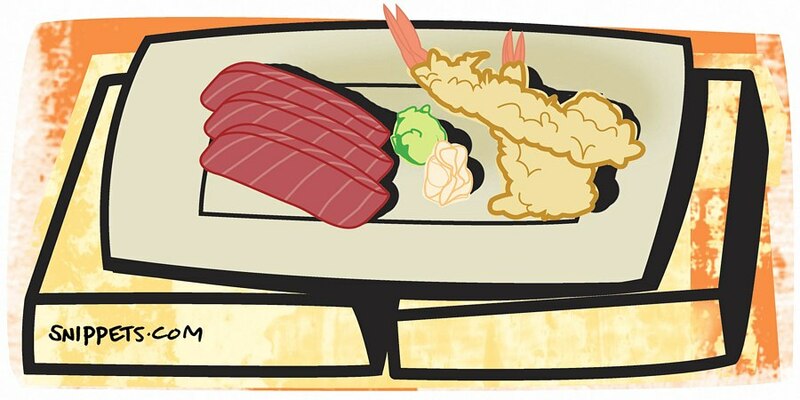 Sashimi and tempura are popular non-sushi items. Sashimi is just a piece of raw fish without any rice. Tempura is seafood (usually shrimp) or vegetables that have been battered and deep fried. 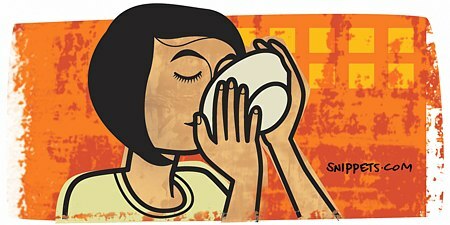 Sake is a rice-based alcoholic beverage that can be served hot or cold. 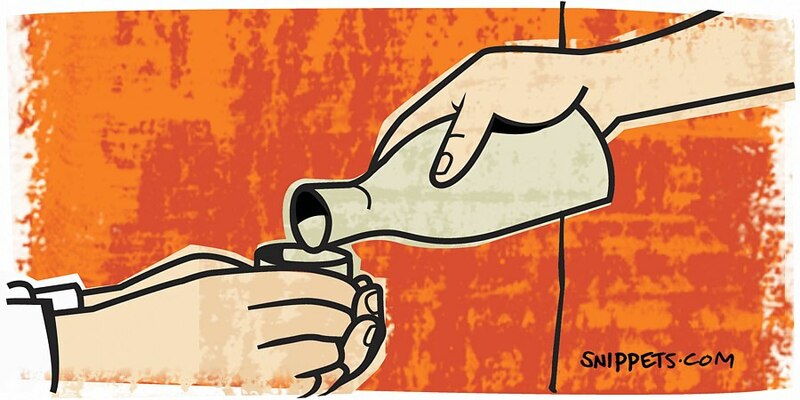 Typically, higher quality sake is served cold. Sake is traditionally enjoyed with sashimi (not sushi), or by itself, before or after the meal. 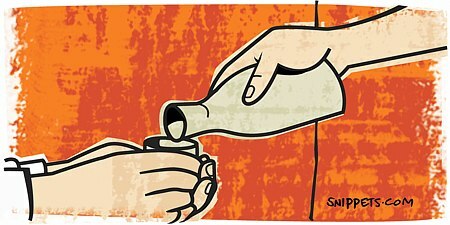 When drinking sake with others, serve your companions, not yourself. They, in turn, should serve you. One of my favorite things to do at a sushi restaurant is to eat a sliver of pickled ginger and immediately follow that with some cold Japanese beer: it creates a tingling and sweet sensation that is surprisingly pleasant. 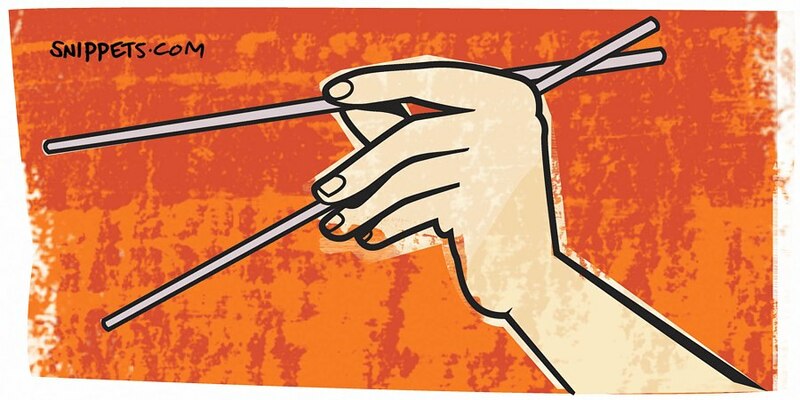 There is really no "right" way to eat sushi, but if you are nervous, your best bet is to pick up the sushi with chop sticks, dip the sushi roll in soy sauce, and then stick the sushi in your mouth and chew. 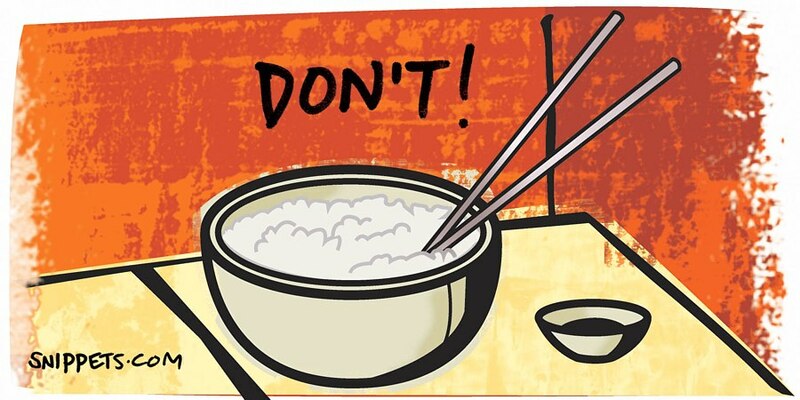 You may want to practice using chop sticks at home, before you eat sushi out in public. Eating sushi like a pro is easy. Simply take up the piece of sushi in your chopsticks, if you like dip it (once! ) in the bowl of soy sauce and/or wasabi (careful, its spicy! ) and place the entire piece in your mouth, fish side down. I love the idea of taking sushi from a community platter with the backside of the chopsticks. It seems like such a warm and generous maneuver... the Japanese have all these little nuanced gestures figured out - very impressive! Everyone mixes their wasabi and soy. I guess I see why you shouldn't. 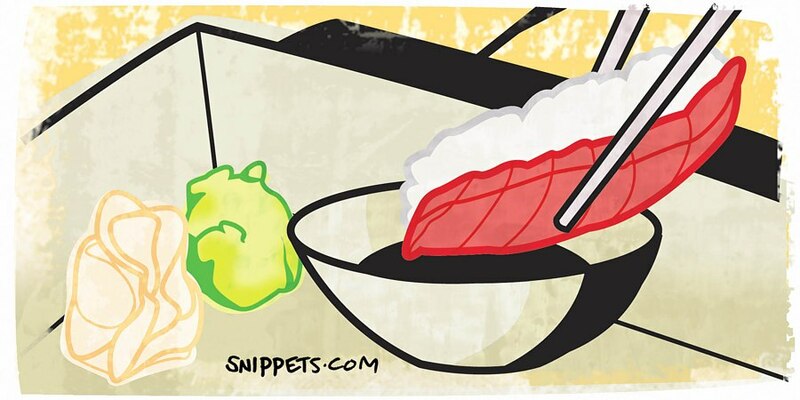 Plus, they put wasabi between the fish and the rice, and too much wasabi, like too much soy sauce, is taking away from the delicacy of the fish. I'm gonna try it next time. I have been to sushi restaurants more times than I can count, and I always put sushi in my mouth rice-side down... I am not sure if fish-side down will be better, but I'm sure it will be different - can't wait to try. This is a great little tutorial, answers a lot of my questions. Also, the illustrations are wonderful! Eating with your hands is great news! I've taken my parents to eat sushi only to be turned off because they can't master chopsticks. The hands option eliminates that. We'll all have to eat with our hands though so they don't feel like the only ones. I actually eat sushi for the combination of flavors of the wasabi, soy sauce, rice, nori and fish, and yes, I get rolls. I think it's ridiculous to assume that people only eat it for the fish flavor and none of the others. The more burn the better! There is no right/correct way - perhaps there is a tradition, but even that gets bent by your average person eating out, japanese or not. As to condiments - why should sushi be any more sacrosanct than other food that receives salt, pepper, ketchup, whatever. It's personal taste. Who cares? I really like these drawings! I would love to show these to my second-grade teacher who always pressured me to color within the lines! I am guilty of poking the chopsticks vertically into my bowl of rice; a bowlful of sticky rice just seems to call out for my chopsticks, but now that I think about it, it does seem a little uncouth. I like this! 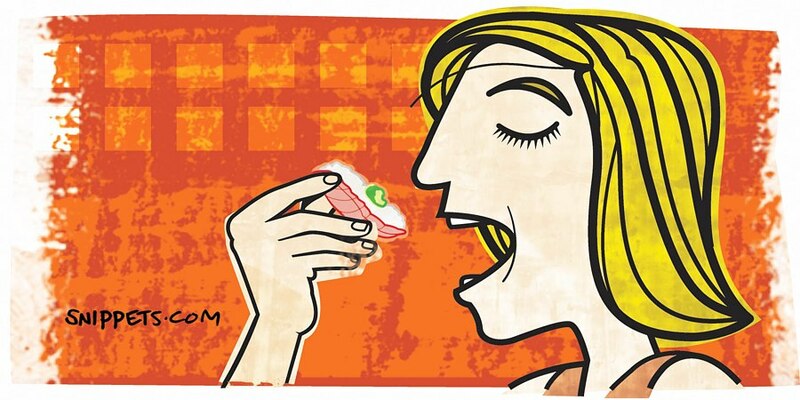 I didn't know there's a right way to eat sushi and I am loving the illustration! If the chef doesn't specifically advise soy sauce, I don't add it, dip sushi in it, or even let it wallow. Same goes for Wasabi. He's the artist, not me, and listening to his advice has actually made for better sushi experiences. People who dunk the rice part into the soy sauce bowl and drown their sushi is one of my pet peeves. These sushi chefs train for years to put together amazing taste combinations, and then people drown it all out with salty soy sauce - a tiny dip is enough! What if your roll pieces are too large -- can you eat them in multiple bites too? Don't they fall apart? Or are you always supposed to eat sushi rolls in one bite, regardless of the size? Funnily enough, I've eaten sushi with Japanese people who mix the soy and the wasabi directly, and then usually alternate between using it and not using it, so you're getting both the true flavor and the additions you want. There's no 'right' - it's preference. if you really want to suprise the sushi chef..DO NOT USE soy sauce. Most chefs serve it to you the way it should be eaten. SAVOR the fish! Do you like eating raw fish? How Can I Tell When Meat is Unsafe to Eat? Is it okay for a vegetarian to eat seafood? Is it okay to eat fish that were left out overnight? Why should you eat ginger roots with Sushi?